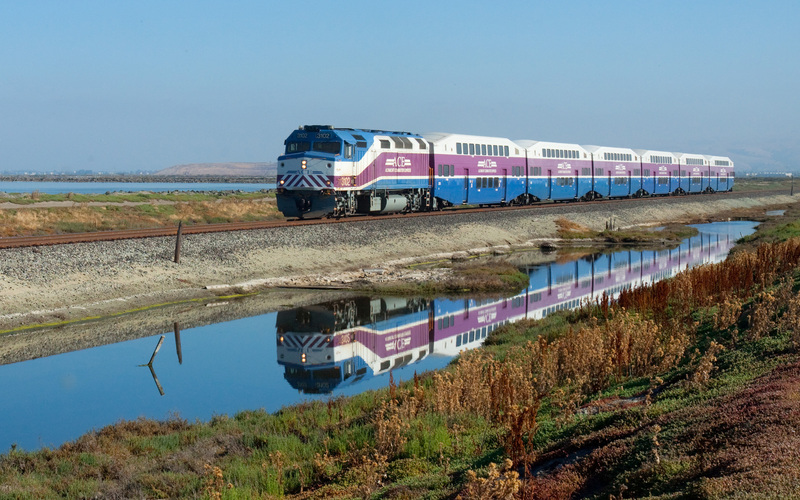 The Altamont Corridor Express. Photo: Wikimedia Commons. Yesterday’s evening commute turned into a nightmare for passengers on the Altamont Corridor Express (ACE) train, when–according to the latest reports–a mudslide sent a tree onto the tracks and caused a major derailment. The incident happened at 7:15 p.m., when train number 10 derailed in Niles Canyon, about a mile west of Sunol. According to an ACE release, there were 196 passengers. Four were seriously injured. According to reports, this is only ACE’s second incident in nearly 20 years of operations. Most passengers on the train were unharmed. Reportedly, passengers in the cars at the rear didn’t even realize the front of the train had derailed. Only “two of the five cars derailed,” explained Brian Schmidt, a spokesman for ACE. Meanwhile, “Union Pacific is in the process of getting cars back on the tracks so they can move them out of the area, do inspections, and repair any damage,” said Schmidt. He said they would have a better idea of how long it will take to make repairs later today and restoring service by the end of the week was a possibility. “We’re hoping. We don’t know for sure. We’re waiting to find out the condition of the track,” he said. Schmidt confirmed that air brakes, basic safety technology developed 150 years ago, almost certainly contributed to saving lives in this crash. Train brakes are connected to an air system by rubber hoses. If the hoses separate, as in a derailment, the air pressure drops and brakes along the entire length of the train are automatically applied. It’s a safe bet that’s what kept the last three cars from running off the tracks. While train wrecks make for dramatic headlines, any Streetsblog reader should already know that cars are the big killer when it comes to transportation. That got underscored even as a reporter was covering the train crash. Still, the ACE wreck is a reminder that when you move people around in machines things will sometimes go horribly wrong. Coincidentally, the Fuse, a web site that tracks energy policy, released a piece today about Hyperloop and California’s High-Speed Rail (HSR). (Featuring an interview with yours truly). Hyperloop is a proposal for a new transportation system that has people traveling in pods that shoot through long tubes at jet-aircraft speeds. So what happens when a mudslide hits a Hyperloop tube? Imagine if the tube suddenly came out of alignment as a wall of heavy mud and debris slammed into it–and then a capsule full of people came through at 700 mph? In the event anyone survived the crash, how would rescue teams get to the passengers? It’s hard enough cutting people out of train cars, where first responders can at least see the cars and the people through the windows. But imagine trying to cut through a metal tube to try and find a capsule and then get into the capsule to get to survivors? Is it unfair to compare Hyperloop to a lumbering diesel powered ACE train? Maybe, but High-Speed Rail (HSR), which the Hyperloop boosters seem to hate so much, has also shown itself pretty resilient to track misalignments. For example, in 1993, a French High-Speed Train was traveling at 183 mph through an old WWI battlefield in France during a period of intense rains. A hole opened up under the tracks–possibly from an old trench or fox hole–and the rails came out of alignment. The train derailed but managed to decelerate and stop without jackknifing. There were no serious injuries, due to the design of the wheels and passenger cars; built on years of experience and testing and dealing with real-world hazards. The point is, it takes a long time to build a safe, fault-tolerant technology. New tech, even when it works, is by definition unproven. Businessmen from Silicon Valley need to remember that transportation technology is not the same as developing a new smart phone; nobody dies if a smart phone gets hit by a wall of mud. In the real world, transport tech has to stand up to a whole lot of potential disasters. That’s why claims that rail transit is a “dinosaur” technology, as made by Hyperloop Transportation Technologies’ CEO Dirk Ahlborn in the Fuse report, should be met with extreme skepticism, if not outright derision. I first rode ACE in November 1998. They have been operating for nearly 20 years, not ten. Roger, you should learn the basics about the Hyperloop before you attempt to criticize it. Steel, not aluminum tubes. That’s a giveaway that you haven’t done your homework. Read up on Hyperloop braking systems and emergency exits. We need to largely eliminate fossil fuel use. That means we probably need to get people out of airplanes. At least limit flight to only jumping between continents and to islands. HSR won’t get us there in an acceptable way. It’s too slow. Great for moderate distance runs but not across continents. The Hyperloop (if it proves out) could mean that one could go from SF to NYC in about the same time as by commercial jet. Using only (renewable) electricity. No turbulence, no fogged in airports, or waiting to takeoff/land. People would like that. We could ‘loop to Anchorage or eastern Canada and use a plane (biofueled?) to hop to another continent and then get back in the ‘loop. The capsule speed is dependent on a vacuum in the tube, if the tube were to be ruptured, definitely the capsule would be immediately slowed down due to the ensuing air resistance. Presumably the capsules would also apply automatic braking if it detected a sudden increase in air pressure. Actually it is a little surprising that that lack simple ultrasonic sensors which you can get on a $30,000 car. Although it would probably have been difficult for a train to come to a complete stop, presumably automatic braking in advance of the landslide would have decreased the amount of damage the train sustained quite a bit. Especially given that an increase in velocity by 2x has a four fold increase in impactive energy. Sorry, you’re right. The tubes are steel. The pods are aluminum. Again, my issue isn’t with developing this technology. Will Technology Save Us From Another Train Crash Like Spain’s? Self Defense Tip for BART Users: RUN!!!! Streetsblog PSA : If someone on your train is waving chainsaws and threatening to chop someone's head off, run--don't just film it for your social media. Did Some Political Pork Give a Boost to High-Speed Rail?